What’s next for FOAM and photography? Amsterdam’s number one museum for contemporary photography Foam is celebrating it’s tenth year of existence. To celebrate, they have invited four guest-curators to answer the following question: “What’s Next?”. A logical question from FOAM, as they are all about showing you the latest in photography. New photographers that have just arrived at the scene, as well as the new classics. The guest curators are Lauren Cornell (New Museum, New York), Jefferson Hack (Dazed & Confused), Erik Kessels (KesselsKramer) and Alison Nordström (George Eastman House, Rochester). Their new exhibition, called The Future of the Photography Museum, is based on the before mentioned question of “What’s Next?”. It opens tonight and will try to provide you with some answers. 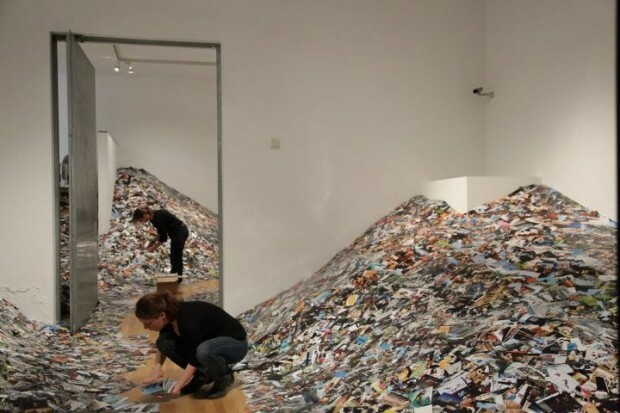 For example, check out how Erik Kessels incorporated the world of Facebook and Flickr into his part of the exhibition to show how people nowadays are drowning in images. He used one million pictures (!!) to exemplify this idea. Promises to be pretty spectacular. Jefferson Hack from the über-hip London based magazine Dazed and Confused has set up an exhibition showing how digital images can exist without being projected. He has made two enormous sculptures that promise to unify image and form.. The other two curators are Allison Nordstrom from George Eastman House, New York and Lauren Cornell from New Museum in New York. Lauren has curated an exhibition with up and coming photographers that you definitely should check out since it will not only feature photography but also video, internet and installations. Allison has made a selection from George Eastman House featuring pictures from the 19th untill the 21st century, thus putting the phenomenon of photography in a historic and wider perspective. Make sure you check it all out from November 5th onwards. To motive you some more FOAM and Overdose have arranged 2×2 tickets to give away. Post a link to your favourite photograph below this post on our Facebook page to enter the give-away. More about the concept: What’s Next?